It feels a bit presumptuous of me to critique a book by an author as amazing as Barbara Kingsolver, but...I do have some thoughts I want to share. Publisher: Harper Collins, 2012. 436 pages. Flight Behavior is a brilliant and suspenseful novel set in present day Appalachia; a breathtaking parable of catastrophe and denial that explores how the complexities we inevitably encounter in life lead us to believe in our particular chosen truths. Kingsolver's riveting story concerns a young wife and mother on a failing farm in rural Tennessee who experiences something she cannot explain, and how her discovery energizes various competing factions—religious leaders, climate scientists, environmentalists, politicians—trapping her in the center of the conflict and ultimately opening up her world. 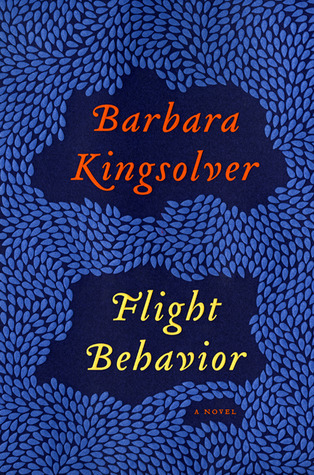 Flight Behavior is arguably Kingsolver's most thrilling and accessible novel to date, and like so many other of her acclaimed works, represents contemporary American fiction at its finest. Barbara Kingsolver is an amazing writer, no question about it. And this novel is good. Just at first, I didn't think I could relate to the main character, but she soon proved to have the depth needed to work as someone completely unlike myself (I think that if a character is a lot like ourselves, it's easy to let thinness in their development slide, but if they are nothing like the reader, it takes mastery to make them real and believable--and someone we care about). The opening chapters have an element of the mystical that I also found off-putting, but that turns out to be all part of Kingsolver's plan, and I am glad I stuck it out. The whole story is unfolding through the eyes of Dellarobia Turnbow, who is poorly educated but by no means dumb. It's kind of fun to watch her develop and blossom as her intellect is awakened from a 10-year sleep, and I think that is the real heart and strength of the book. My main concern, as the book went on, is that the story at times gets lost in the message. I never thought I'd hear myself saying this, but I think Kingsolver is working too hard at getting the message of conservation and climate change across. Heaven knows I think it's a vital message. I just didn't like it when the book skewed into the realm of a screed, rather than a story. It's not fatal, and it's not throughout, but the author is clearly struggling a bit with balance. In the end, the story wins. It's no easy resolution, but I think Kingsolver found the only way forward for Dellarobia that the reader can accept as workable. This is a book for readers who want to engage and think a bit, as well as those who just like a good story about complex people. FTC Disclosure: I checked Flight Behavior out of my library, and received nothing from the writer or publisher in exchange for my honest review. The opinions expressed are my own and those of no one else. I am disclosing this in accordance with the Federal Trade Commission's 16 CFR, Part 255: "Guides Concerning the Use of Endorsements and Testimonials in Advertising." So, a kind of bitter-sweet ending? That's the vibe I'm getting. Kind of. I'm not sure bittersweet is the word I'd use, but it's in the neighborhood. It's not an "everything is perfect" ending. You have some fascinating books in your library. Not bad, for a smallish branch library! I do also have the good fortune to be able to borrow (for free) from any library in our county. That rather increases the supply!